1. Outdoor ice cream kiosk specification. Accessories: light, LED light, spotlight, locks and keys, light box, wires, sockets,etc. 2. This is a knocked-down outdoor ice ceam kiosk. 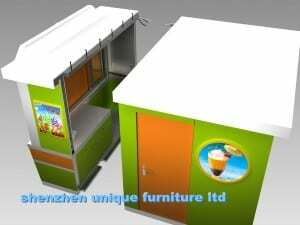 3d max design pictures show as below. Pay 300usd as design deposit. Just deposit, after order confirmed, 300usd will be refunded to you. According to your requirement to start design, take about 3-5 working days. Confirm, we can provide three times for free modification. 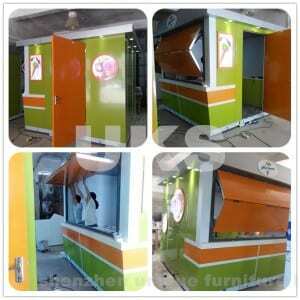 We are custom made outdoor kiosks manufacturer with more than 9 years experience. 2)Exquisite workmanship to serve with high quality. 3)Professional design team, we can design a new one based on it to meet your need. 4)Practical for your showing products and make value use of the space. 4. Production photos about this outdoor ice cream kiosk. 6. About our price for outdoor ice cream kiosk. Quote customer EXW price or CIF price. 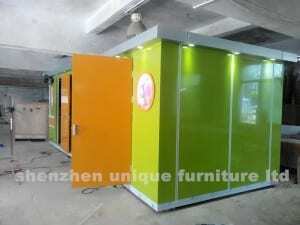 Depend on the exact size, style and material of outdoor kiosk. Thank you for reading! 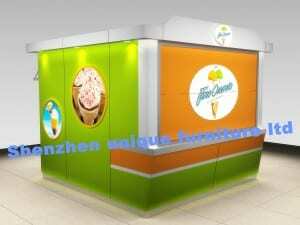 Any question about the outdoor ice cream kiosk, please feel free to contact me.